The Rev. 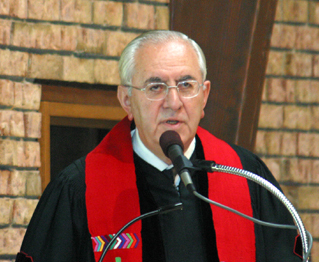 Dr. Vahan H. Tootikian, is the Minister Emeritus of the Armenian Congregational Church of Greater Detroit. He was the senior pastor of the church for 30 years, from 1975-2005. Rev. Dr. Tootikian is a graduate of the Near East School of Theology, and did his graduate work at Harvard and Andover Newton Theological seminaries, earning two masters and a doctorate. He and his wife Rosette, live in Royal Oak, Michigan. Along with his pastoral duties, Rev. Tootikian has been a lecturer at Lawrence Technological University, Southfield, MI, and also a lecturer at the University of Michigan. He has authored thirty-two books, and is a regular contributor to several papers and magazines. Since January 2003, Rev. Dr. Tootikian has been the Executive Director of the Armenian Evangelical World Council.